The Notre Dame Shakespeare Festival production of William Shakespeare’s “Hamlet,” directed by David H. Bell, will be performed Aug. 14 through 26 and features a company of professional actors including NDSF veterans Andy Truschinski in the title role, Elizabeth Ledo as Ophelia and Donald Carrier as Polonius. “Hamlet” will be presented in the Decio Mainstage Theatre in the DeBartolo Performing Arts Center on the campus of the University of Notre Dame. Tickets are on sale now for $12 to $75 with special discounts available for groups of 10 or more. A special family performance is offered at 2 p.m. Aug. 18 (Saturday) with four tickets for only $32. For more information or to purchase tickets, contact the DeBartolo Performing Arts Center ticket office at 574-631-2800 or visit the website. David H. Bell, an internationally recognized director, choreographer and author, returns to the NDSF to direct. 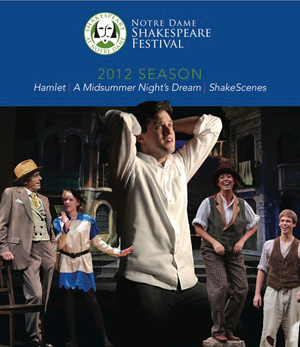 Bell directed last season’s acclaimed production of “The Merchant of Venice,” and “Twelfth Night” in 2009. In Chicago, Bell’s work has received 41 Joseph Jefferson Award nominations and won 11. He has directed numerous productions at Chicago Shakespeare Theater including “The Taming of the Shrew,” “As You Like It,” “Murder for Two” and “The Comedy of Errors.” He has directed more than 30 productions for Marriott Theatre in Lincolnshire, Ill., and has directed both on and off Broadway in New York, working with such artists as Lauren Bacall, Patti LuPone and Carol Channing. The title role will be performed by Truschinski, who returns to NDSF after appearing as Bassanio in “The Merchant of Venice.” He has performed at Chicago Shakespeare Theater, American Players Theatre, Riverside Theatre and Montana Shakespeare in the Parks. Joining Hamlet will be Lisa Brescia as Gertrude, whose Broadway credits include Elphaba in “Wicked,” Amneris in “Aida” and most recently as Donna Sheridan in “Mamma Mia!” Also joining the cast are Jeff Cummings as Claudius and Daniel Cantor as Ghost/Player King/Gravedigger. The creative team for “Hamlet” is led by Ryan Producing Artistic Director Jay Paul Skelton. Shakespeare at Notre Dame is a regional center for Shakespeare performance, educational outreach and academic research and includes the Notre Dame Shakespeare Festival, Actors From The London Stage, visiting guest artists and lecturers, touring productions and new media library collections. Originally published by Chuck Gessert at newsinfo.nd.edu on August 10, 2012.